This page provides a more detailed description of the Clock System on SAM D21 MCUs, covering key registers and basic coding steps required to configure/use the clock. The main system clock GCLK_MAIN and clocks generated from it (CPU, AHB/APB Bus Clocks) are called "synchronous" clocks, while the generic clocks are called "asynchronous" clocks (with respect to the system clock). Peripheral access registers (the programmer’s interface) are clocked by the synchronous clock generated by the Power Manager for the peripheral; internally, the peripherals use the asynchronous clocks generated by the Generic Clock Generators (the SERCOM peripheral for example uses a generic clock to source the baud rate generator). As the CPU and the peripherals can be in different clock domains, some peripheral accesses by the CPU need to be synchronized. In this case, the peripheral includes a SYNCBUSY status register that can be used to check if a sync operation is in progress. For a general description, see "Register Synchronization" below. The SAM D21 MCU devices have a number of master clock source modules, each of which being capable of producing a stabilized output frequency, which can then be fed into the various peripherals and modules within the device. Possible clock source modules include internal R/C oscillators (OSC8M, OSC32K, OSCULP32K), internal digital frequency-locked-loop (DFLL) modules (DFLL48M), as well as external crystal oscillators and/or clock inputs (XOSC, XOSC32K). Within the SAM D21 devices, there are a number of generic clocks; these are used to provide clocks to the various peripheral clock domains in the device in a standardized manner. One or more master source clocks can be selected as the input clock to a Generic Clock Generator, which can prescale down the input frequency to a slower rate for use in a peripheral. Additionally, a number of individually selectable Generic Clock Channels are provided, which multiplex and gate the various generator outputs for one or more peripherals within the device. This setup allows for a single common generator to feed one or more channels, which can then be enabled or disabled individually as required. Clock Generator 0 is dedicated to supplying GCLK_MAIN. Multiplexer 0 (Peripheral Channel 0) is dedicated to supplying the DFLL48M reference clock. Writing these registers is done by setting the corresponding ID bit group. To read a register, the user must write the ID of the channel, i, in the corresponding register. The value of the register for the corresponding ID is available in the user interface by a read access. Do an 8-bit write of the i value to GENCTRL.ID. Read the value of GENCTRL. Refer to the clock-chain examples below to see some GCLK initialization code sequences. and an interface clock from PM (synchronous). A running clock source (SYSCTRL). A clock from the Generic Clock Generator must be configured to use one of the running clock sources, and the generator must be enabled (GCLK). A Generic Clock Multiplexer (Peripheral Channel) that provides the generic clock signal to the peripheral must be configured to use a running Generic Clock Generator, and the generic clock must be enabled (GCLK). The peripheral interface clock needs to be unmasked in the PM. If this is not done, the peripheral registers will read all zeros and any writing attempts to the peripheral will be discarded. See the SERCOM0 Clock Chain Example below for a code example. OSC8M is enabled and divided by eight. Generic Clock Generator 0 uses OSC8M as source and generates GCLK_MAIN. 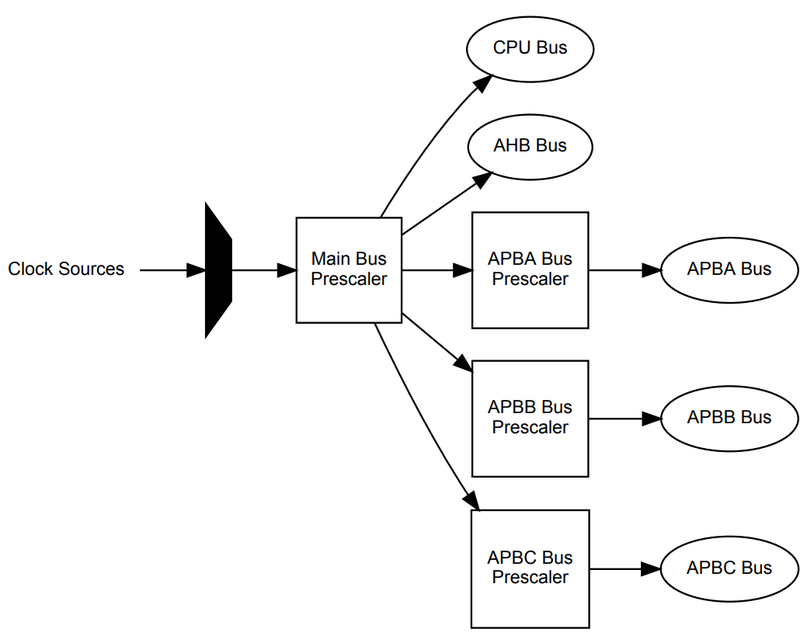 CPU and BUS clocks are undivided (divide by one). SOME synchronous peripheral clocks are enabled (see the PM chapter in the datasheet for details). Generator 0 is using OSC8M as a source without division and generates GCLK_MAIN. Generator 2 is using OSCULP32K as a source without division. All Multiplexers (Peripheral Channels) are disabled except WDT Generic Clock (GCLK_WDT), which uses Generator 2 as a source. Refer to the Power Manager (PM) section in the datasheet to learn about the different device reset types on SAM D21. The next figure shows an example where SERCOM0 is clocked by the OSC8M. OSC8M is enabled with 8 MHz output and fed to Generic Clock Generator 0 which provides GCLK_MAIN as source to the synchronous clock generator. The Generic Clock Generator 1 also uses the OSC8M as its clock source and feeds into Peripheral Channel 20. The Generic Clock 20, also called GCLK_SERCOM0_CORE, is connected to SERCOM0. The SERCOM0 interface, clocked by CLK_SERCOM0_APB, has been unmasked in the APBC Mask register in the PM. The next figure shows the common configuration to clock the device to its maximum speed (48 MHz) using the DFLL48M clock source. The DFLL48M reference clock source is XOSC32K but it can be another one. The DFLL48M module has been optimized for a 32.768 kHz crystal as source clock (from the datasheet, the DFLL48 maximum reference frequency = 33 kHz). Set Flash wait states for 48 MHz (per Table 37-40 in the datasheet). Enable XOSC32K clock (External on-board 32.768 Hz oscillator), will be used as DFLL48M reference. Put Generic Clock Generator 1 as a source for Generic Clock Multiplexer 0 (DFLL48M reference). Switch Generic Clock Generator 0 to DFLL48M. CPU will run at 48 MHz. See the DFLL48M 48 MHz initialization project as an example that configures the DFLL48M for 48 MHz operation using the steps described above. Communication between these clock domains must be synchronized. This mechanism is implemented in hardware, so the synchronization process takes place even if the peripheral generic clock is running from the same clock source and on the same frequency as the bus interface. Registers with the "Write-Synchronized" property are synchronized when written. SYNCBUSY bit is set in hardware when writing to a write-synchronized register. Stall occurs if trying to write to a peripheral register when the SYNCBUSY bit is set. For example, the GCLK GENCTRL register is specified as "Write-Synchronized" in the datasheet. For more information on register synchronization, review the "Clock System" chapter in the SAM D21 device datasheet.